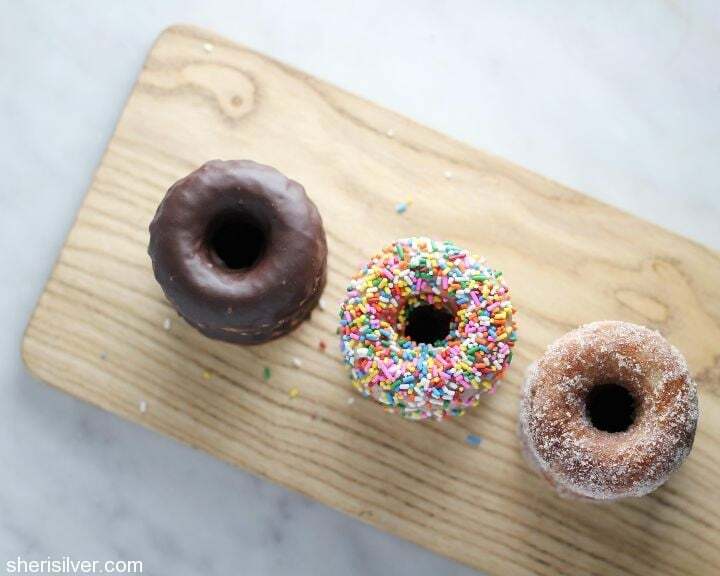 baked doughnuts – three ways – to welcome the new year! Happy New Year’s guys! Hope your holidays were everything you wanted them to be. I had everyone under one roof for five whole days, which was HEAVEN. I was thinking of kicking things off here for 2016 with a recipe that was quick, easy and at once indulgent as well as “not-too-bad-for-you”. And, just like that, the nice people at Chobani invited me to share a recipe that showcases how I use my leftovers. I know – I KNOW – you’re now thinking, “Sheri – what’s up? You don’t eat yogurt. Like, ever”. But………….I USE yogurt often in my baking. So, ironically, I often have an opened container of yogurt sitting in my fridge. That I won’t actually consume. So I have to find a recipe or two to use it up. And this week I am happy to share my latest creation – these delicious baked doughnuts! Yogurt is a fabulous addition to baked goods – it lends incredible moistness and a subtle tang that offsets all that sugary sweetness perfectly. 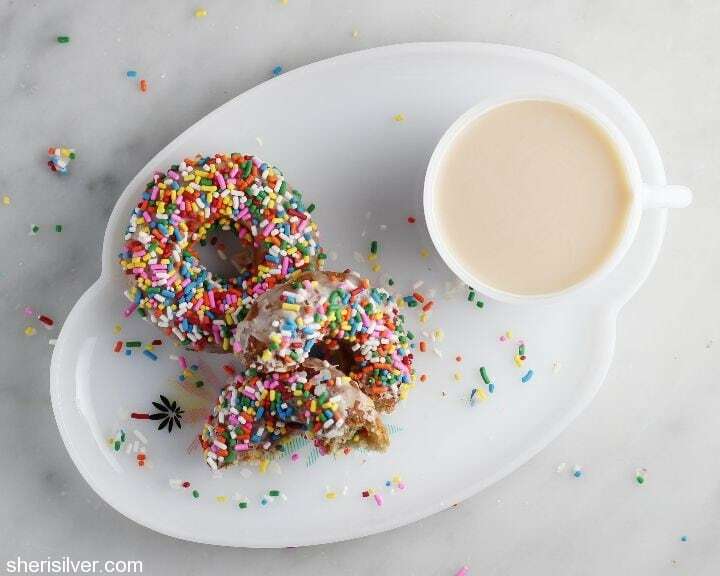 Ever a fan of my doughnut pans, these whipped up so quickly that I decided to make three different toppings – cinnamon-sugar, glazed with sprinkles and chocolate frosting. These are the perfect quick-yet-festive breakfast for New Year’s morning – or Saturday! How do you use yogurt? 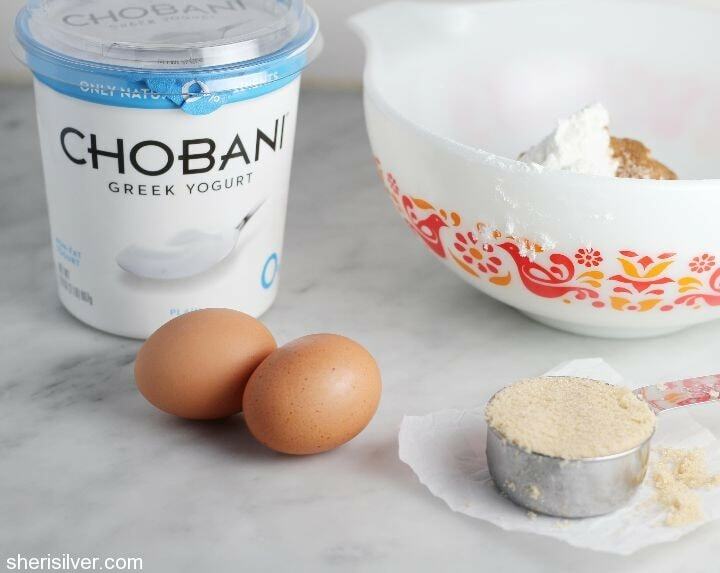 For more inspiration, check the hashtag #madewithChobani on Instagram! Preheat the oven to 350. Spray three to four standard sized doughnut pans with non-stick spray (I get between 18 and 20 doughnuts from this recipe using these pans). Whisk the eggs in a medium bowl – add the sugar, milk, yogurt, melted butter and vanilla, whisking again till combined. Add the flour, baking powder, baking soda, nutmeg and salt – stir till just combined (do not overmix). Transfer the batter to two quart-sized ziploc bags (check out this post for my mess-free technique!) and snip an opening in the corner of each. Pipe the batter into your pans, filling half-way. Bake for 9-12 minutes or until the edges are lightly browned and doughnuts are springy to the touch. 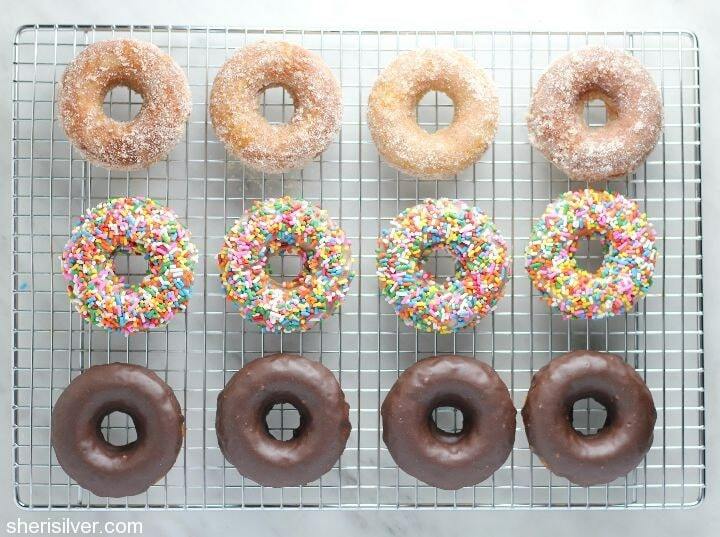 Remove from pans (use a small knife to assist if needed) and invert doughnuts onto a wire rack to cool completely. 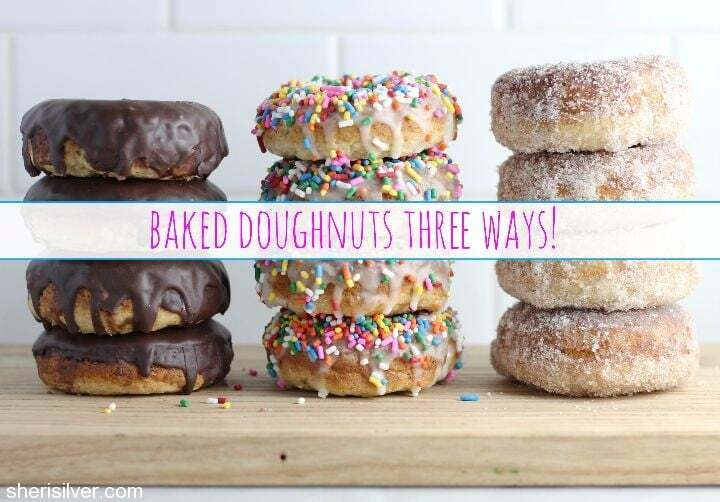 Prepare your toppings and set a wire rack atop a baking sheet lined with foil or parchment paper (Note: I’ve included topping measurements to coat one third of the doughnuts. Simply double or triple the ingredients if you want to use only one or two of the toppings). Cinnamon-Sugar: Melt 1/4 cup unsalted butter – transfer to a small bowl. Combine 1/2 cup sugar with 1/2 teaspoon cinnamon in another bowl. Dip doughnuts into the melted butter, allowing the excess to drip off. Immediately coat all sides in the cinnamon-sugar mixture. Set on the wire rack. Glazed with Sprinkles: Whisk 3/4 cup confectioners’ sugar with 1 tablespoon water (add more sugar if glaze is too thin, more water if too thick). Place colored sprinkles in a small bowl. Dip tops of doughnuts into the glaze, allowing the excess to drip off. Gently but firmly press into the sprinkles; place on the wire rack to set. Chocolate Frosting: Whisk 1/2 cup confectioners’ sugar with 4 teaspoons unsweetened cocoa powder and 1 tablespoon water (add more sugar if frosting is too thin, more water if too thick). 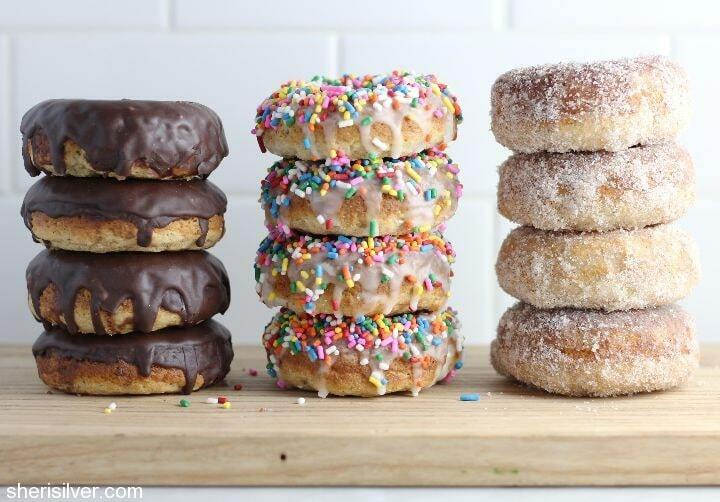 Dip tops of doughnuts into the frosting, allowing the excess to drip off. Place on the wire rack to set. And even more from Chobani! Damn. I’ve been trying not to buy a donut pan. I think you just made me. Ugh! Why don’t you just come over and borrow mine (hint-hint. wink-wink. nudge-nudge. )?